The town of Kindersley is dealing with a big cleanup following a severe thunderstorm on Tuesday evening. 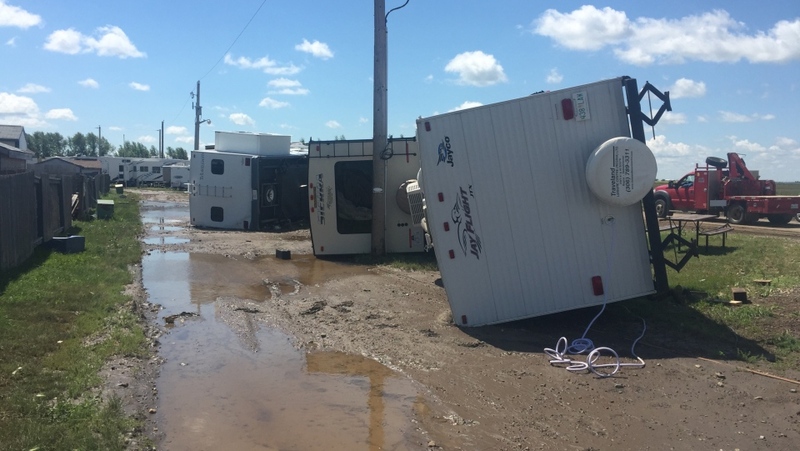 Power lines were down, grain bins toppled over and four RVs flipped over at a trailer park. “It was pretty crazy, pretty hectic,” Kelly Alexander, Golf View Mobile Acres manager, said. He’d never seen a storm cause such damage. According to Environment Canada, Kindersley had wind gusts of up to 89 km/hr. Neil Armstrong was in his camper when a neighbour’s RV fell on top of his. “It sounded like a shotgun going off right beside my head when that trailer hit mine,” Armstrong explained. Fire crews rescued a woman, her daughter and dog from the trailer that was on top of Armstrong’s. “The second person that was in there was her daughter. She actually climbed down inside to be with her mother during that. So then we had the two, plus the dog to bring out,” Kindersley fire Chief Ron Hope told CTV News. Many of the RV owners whose trailers sustained damage say they’ll be spending the next days dealing with insurance claims.